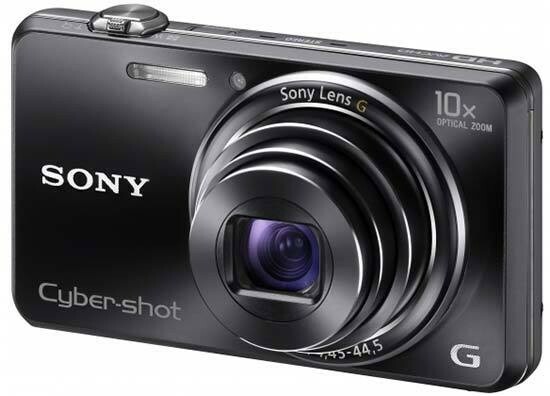 The Sony DSC-WX100 is a stylish new compact camera with a vast array of advanced features. Just 17.5mm slim (at thinnest point), the WX100 has an 18.2 megapixel Exmor R CMOS sensor for better low noise performance, 1080i Full HD movie recording, 10x optical G Lens with a 25mm wide-angle setting, and a 2.7 inch LCD screen with 460k dots. Also on offer are 3D Sweep Panoramas and 3D still images, high resolution panoramas, Superior Auto mode which combines up to 6 images to reduce noise and maximise dynamic range, 10fps continuous shooting, and Background Defocus mode to create portraits with a smoothly defocused background. The Sony DSC-WX100 is available in silver, white or black and costs around £179.99. Looking at the Sony Cyber-shot WX100 is a bit like looking at one of those Hot Rods that were all rusty and beaten up on the outside, but when they set off, they made your teeth chatter. That's not to say that the outside is all beaten up. The analogy simply describes that the unassuming exterior gives no indication to the apparent power that lies beneath. The WX100 is a basic box design of a camera. The corners are only mildly curved off and the lens barrel pokes out of the front slightly to house the large 10x optical zoom. The lens system is composed of Sony G elements which are of a higher standard than you'd find on most other digital compacts. This technology has been migrated over from Konica Minolta G lenses who Sony took over imaging operations from in 2006. Once the image has transferred through the lens, it lands on the sensor. In the Sony Cyber-shot DSC-WX100 is an 18 megapixel Exmor R sensor. Exmor R is the name for Sony's back-illuminated sensors. A typical sensor has circuitry that surrounds each pixel and can block some of the light from getting onto it. On this sensor, that circuitry has been moved to the back of the sensor. This allows more light to land on each pixel. The term “back illuminated sensor” comes from looking at an Exmor R when it's fitted in the camera as it looks as though it's been fitted backwards. This extra light supposedly makes the sensor more responsive in low light and therefore produces lower noise. On the top of the Sony Cyber-shot DSC-WX100 is a power button that sits flush with the body and a raised shutter release button which also has the zoom rocker wrapped around it. The reason for the raised button is to enable you to distinguish between the power button and shutter release so you don't press the wrong one. The shutter release isn't exactly round; it cuts in at the front and is squared off. This would make twisting the zoom action impossible, so to get round this problem and still have a pretty button, the shutter release also twists. here's been some references to “sweeping” and if you're not entirely sure what it means, it describes how you take the panoramic picture. Typically, you have to take a picture, move the camera over, take another, move the camera over and continue this until the shot is done. Then the camera will either stitch the image or you have to do it on software at home. Sweep Panorama is better. You stand in one place, point the camera at the start position, hold the button down and swing round in one continuous movement. A guide on the screen indicates how much space you have left and the camera will stop recording if you move too fast and get blurry pictures. It's a much more convenient way of getting a panoramic picture and works very well. In addition to the 3D panorama modes, there's also an underwater panorama. Don't get excited, the Sony Cyber-shot DSC-WX100 isn't waterproof. It does have a waterproof case (MPK-WH) but that costs roughly the same as the camera so will be out of reach or interest for many users. In the middle of the button section on the back is a jog wheel. Moving this wheel in Panorama mode will switch between the panoramic options. In Shooting mode, it scrolls through the modes you can take pictures in such as Intelligent auto, Superior auto, Program, 3D, Scenes, Picture Effects and Background Defocus which has been given a dedicated slot instead of being in the Picture Effects area. The wheel doubles up it's tasks and you can also press it up, down, left and right to access different areas such as continuous shooting, flash options, self-timer and display options. At the bottom are the main menu button, delete/Help guide button and the playback button to review pictures you've already taken. The Sony Cyber-shot DSC-WX100 doesn't feel a badly made model at all. It's firm to the touch and has buttons in the right places. The scrolling wheel can be a bit temperamental with it's sensitivity but once it's going, it flies through the options. The screen is bright and clear though we did have some trouble in bright sunshine. The areas we're unsure about are the battery compartment door and the lens. While the door has a small strip of metal to strengthen it, it can still be moved from side to side as though it doesn't fit the join to the camera. The lens also has some wobble (which we'd expect when manipulated) but this lens will wobble just by shaking the camera slightly. Sony have changed the way the menu is laid out a few times in recent history. On the WX100, pressing the menu button will open up a display similar to the Function menu on other cameras. It shows the most frequently used modes on the left and these can be scrolled through using the wheel as a pad to go up and down or using the wheel to move left and right. Access to the main menu is through the toolbox icon right at the bottom of the screen. This menu is black with white writing and an orange highlight strip. It's split into four tabs for shooting, main, memory card and demo mode. By pressing left, you can flick through these header tabs or normal scrolling will move through the options one tab at a time. Start up times from cold (switched off) is very good. We managed to power up the Sony Cyber-shot DSC-WX100, focus and take a picture in 1.8 seconds. An average time is 2.5 seconds. Pressing left on the command wheel allows you to switch on the burst mode. It's a burst mode and not continuous mode because of the speed it takes pictures. It takes ten pictures in a second but then needs up to 13 seconds in total to download the pictures. A continuous mode plods along at a slower rate but can go for longer as it downloads while it shoots. Playback mode has a lot of stuff to do. Pressing the button brings up the most recently taken picture and some basic information about it such as the time and date it was taken, the resolution and aspect ratio as well as the file number. Pressing the display button opens three options: Basic info (default), no info and detailed info. The latter shows the flash status, white-balance, ISO, exposure compensation and a histogram of the shot. This box gives a visual display of whether the picture is exposed properly. It shows a graph-like image. The aim is to get the peak in the centre of the frame for a balanced exposure. The menu changes in playback mode bringing up more relevant options such as delete, retouch, Picture Effect, 3D viewing and other viewing modes. You can also protect your pictures, rotate them and open up a camera guide. Aside from that it's a standard playback menu with everything where it should be. The retouch options are basic but the Picture Effects idea is a good one to avoid a lot of forehead slapping with regret of not using one at the time. In the box accompanying the Sony Cyber-shot DSC-WX100, you can expect a USB cable that attaches to the main charger unit with a separate figure 8 (kettle) lead to the mains. There's a lithium ion battery and a wrist strap. As is usually the case these days, the full manual comes on the CD which sounds awkward but is much better for the environment.